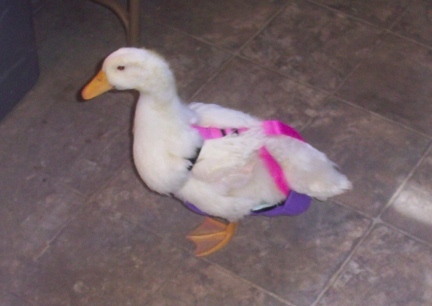 We will soon be offering Duck Diaper Holders in a variety of colors and prints. They will have cloth/waterproof liners and are the same type we use for our own ducks. We will offer the diaper holders in many sizes from duckling to Large Pekin size. PLEASE NOTE: THIS DIAPER HOLDER IS OURS, ONLY HERE FOR THE PHOTO AND NOT FOR SALE, CHECK THE SMALLER SIZED GOOSE DIAPERS LISTED TO SEE IF THEY MIGHT FIT YOUR DUCK. This item is available for download once your order is processed. Your shopping cart will show your total based on the items in it.